Marbella condominiums in Jacksonville Beach, Florida. 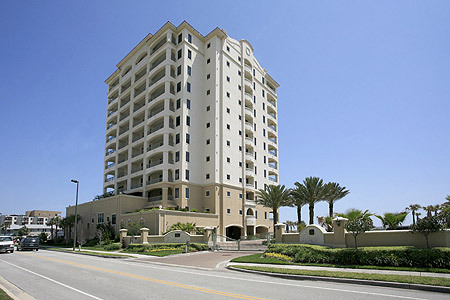 Marbella Condominiums is one of the most luxurious buildings on Jacksonville beachfront. Located on 1st Street South and 9th Avenue South, Marbella is within walking distance of the best Jacksonville Beach restaurants. Residents are close to beach festival, oceanfront park and entertainment venues. Completed in 2006, Marbella features 11-story, 22 exclusive residences of Mediterranean style architecture with only 2 residences per floor and 2 elevators that open to your very own private foyer. All units are end units featuring 5,315 to 4,430 square foot of living space. Amenities include 24 hour manned security, fitness center, social room, oceanfront pool and spa, summer kitchen on all ocean terraces. Jacksonville Beach is one of the country's most prestigious beaches with miles of uncrowded white sandy beaches, numerous activities and abundant wildlife. Jacksonville Beach is a growing community that continues to attract people nationwide for its beauty, proximity to business and residential areas and lifestyle. Jacksonville Beach has numerous stylish eateries and pubs along with a contemporary and growing nightlife. Due to its moderate temperature year round Jacksonville Beach hosts some of the cities' most entertaining events. For a private tour and showing appointment, call (904) 307-8998. If you would like to receive real-time MLS graphical reports, market trend and most recent homes sold in any community, click here.